A no-deal Brexit would increase uncertainty in the short-term, weighing on economic growth in the UK especially through higher inflation and trade frictions. EU27 countries would also face lower GDP, but to a more limited extent due to lower trade dependence. We estimate that a disruptive Brexit could cause UK corporate insolvency growth to be 14% higher than in a smooth transition. The retail sector is particularly exposed due to higher inflation while the manufacturing and chemicals sectors would suffer due to trade barriers being imposed. The impact on insolvencies in the EU27 would be much more moderate, but still significantly negative. Those countries with close trade ties to the UK like Ireland, Belgium, the Netherlands, and Denmark are forecast to see the largest impact on insolvencies. Less than four months to go until the United Kingdom is scheduled to leave the European Union, it remains unclear whether or not the UK will leave with a smooth transition. In late November, the UK government and EU signed a draft withdrawal agreement and political declaration on their future trading relationship. The draft withdrawal agreement includes a 21-month (extendable) transition period, a backstop for the Irish border issue based on a common EU and UK customs territory, citizens’ rights, and a financial settlement. Instead of providing confidence, largely negative reactions from Members of Parliament greatly increased uncertainty around the likelihood of it passing the Parliamentary vote on December 11. Should this deal fail, the chance of the UK exiting the EU on March 29, 2019 with no deal in place – a cliff-edge Brexit – increases substantially. A no deal departure from the EU would mark an overnight end to the free movement of goods, services, capital, and people between the UK and the EU27. As such, there would be large economic costs, mostly borne by the UK, as compared to a smooth transition that would allow nearly two years to establish and adjust to new arrangements. Economic growth would be significantly lower in the UK in 2019 and 2020, while the negative impact on GDP growth in the EU27 would be more limited. However, EU27 countries with close trade and investment ties to the UK would see significant negative effects. This report aims to quantify the effect on business insolvencies in Western Europe of a no-deal Brexit compared to a Brexit including a smooth transition period. We use Oxford Economics’ ‘no-deal’ and the Bank of England’s (BoE) ‘disruptive no-deal’ scenarios as a baseline for our own scenario testing. 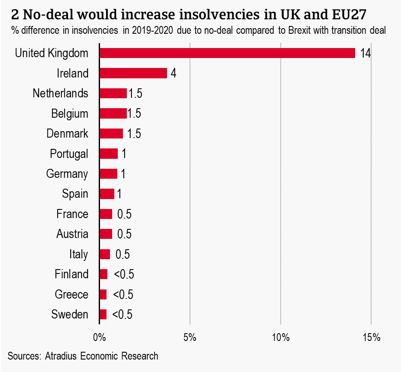 In line with GDP developments, a no-deal Brexit would lead to a significant increase in business insolvencies in the UK and to a moderate degree in the EU27. Uncertainty around the Brexit process and the British political outlook is likely to increase sharply if the UK House of Commons rejects the withdrawal agreement. The possibility remains for an amended deal to be ratified in a second vote within 21 days of the meaningful vote. However, if a second vote is not pursued or fails, political uncertainty would increase due to an expected leadership challenge. Time and willingness from the EU to renegotiate the deal is also dwindling, increasing the risk of the UK departing the EU in March 2019 without a deal. A no-deal Brexit would have significant ramifications for the UK as well as for the EU27, though to a much more moderate extent. In order to quantify these effects in the immediate aftermath of Brexit we employ Oxford Economics’ no-deal Brexit scenario and build upon it with the Bank of England’s scenarios published on 28 November. The BoE does not assign any probability to its scenarios but paints two ‘no deal, no transition’ scenarios: a disruptive and a disorderly Brexit. We consider the disruptive scenario as most likely in the case the UK leaves the EU, and thus as a baseline for this analysis, and the disruptive as a worst-case scenario. It does however serve to emphasise that the risks to our GDP and insolvency outlook here are to the downside. The key short-term economic impacts would come from the increased costs of trade. Trade between the UK and the EU27 would revert to WTO tariffs. UK goods exports to the EU27, which account for 48% of total exports, would be subject to a trade-weighted average tariff of 5.7% while EU-27 exports (only 16% of total extra-EU exports) to the UK would face 4.3% tariffs. For the UK, these tariffs would also apply on trade with other countries with which the EU has a trade agreement in place, like Norway, Korea, and South Africa, accounting for another 16% of UK exports. There would also be significant non-tariff barriers to trade, including customs controls, new border checks especially on food and agricultural products, and regulatory barriers. We expect associated disruptions at the border to be contained as the UK would continue to recognise EU product standards. The threat to services is even greater as non-trade trade barriers such as regulatory restrictions play a prominent role. These can only be reduced by regulatory harmonisation. 31% of UK trade with the EU27 is services. Without regulatory harmonisation, WTO rules would not prevent the EU from blocking British firms offering services in the EU. Related to this is significant uncertainty surrounding passporting rights which allow UK financial services firms to serve clients anywhere in the EU27. Large firms have already taken steps to set up new branches based in other EU countries in order to avoid disruptions in serving clients. EU investors that hold assets in London are also subject to potential passport restrictions. For EEA firms providing services within the UK, the Bank of England has announced a Temporary Permissions Regime, which would enable businesses to operate as a Third Country Branch for up to 3 years subject to compliance with UK regulatory requirements. 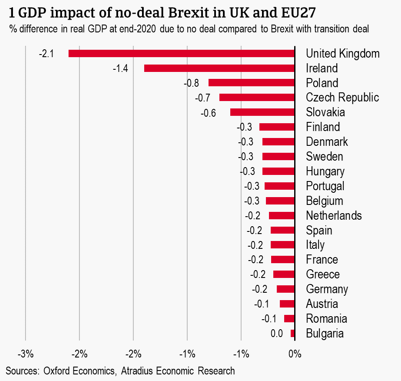 A no-deal Brexit would be disruptive for both the UK and the EU27, but due to the relative trade exposures, the UK is clearly the most exposed. The first disruptions would come through financial markets ahead of the UK’s disruptive departure. As the likelihood of a deal decreased in November, sterling has already depreciated 3% against the US dollar or 11% from its peak this year. Negative reactions from financial markets of no-deal would lead to further depreciation, bringing it to around GBP 1.13 per USD in Q2 of 2019, a further 11% depreciation. GBP depreciation has helped keep UK equities strong in the aftermath of the Brexit referendum thanks to the relative increase in profits generated abroad. In this no-deal case though, this would no longer be sufficient to offset the negative sentiment surrounding UK prospects. While the weaker pound sterling would mitigate some of the damage from new trade barriers, it would also feed into higher domestic price pressures as the price of imports increases. Inflationary pressures would also be compounded due to tariffs on imports from the EU and other countries with whom the EU has FTAs. As a result, inflation would likely surge from 2.4% currently to just over 4% in mid-2019. While wage growth has been accelerating, it would not be able to keep up with this pace – especially considering the negative impact of no-deal on the labour market – severely squeezing household purchasing power. The euro would also fall victim to some depreciation. The euro has also been depreciating lately against the dollar, in part due to increasing political risks in Italy, France, and the Brexit negotiations. This market pressure would continue as eurozone countries would also face negative economic consequences, albeit to a lesser extent. Furthermore, the US dollar would continue appreciating as a safe haven asset in a time of uncertainty and as the interest rate differential continues to increase as the ECB keeps rates unchanged and the Fed continues gradually tightening monetary policy. This would translate to a relatively weaker euro too: about 4% lower against the dollar in 2019 compared to 2018. Overall, the impact on GDP in the UK is significantly negative but it does not spell disaster. By end-2020, UK GDP could be over 2% lower than it is forecast to be under a smooth transition. Higher inflation would strain private consumption, the strongest component of UK GDP growth. The surrounding uncertainty would continue to weigh on investment as well. Business investment in the UK is expected to be nearly 7% lower by end-2020 than the baseline, due to higher uncertainty, lower demand, and some relocation to the continent. We expect the negative impact to be cushioned by increased government spending – potentially supported by the money earmarked by the EU divorce settlement – and loosened monetary policy. However, monetary support is a key uncertainty. The immediate shock would be negative on demand and could motivate the BoE to cut rates back to 0.25% in order to support demand, and overlook the temporary sterling-driven shock to inflation. However, higher inflation may also cause the BoE to increase rates more rapidly. For the EU27, the impact on GDP growth is much more limited. Those countries with the highest trade exposure to the UK are most vulnerable to negative impacts, but since these countries have a relatively lower concentration of exports to the UK than vice versa, the impact is much smaller. This negative effect would also be largely mitigated by the weaker euro for eurozone member-states. This is the main reason why the impact on GDP of highly exposed countries like the Netherland and Belgium is more modest: the weaker euro would boost competitiveness for exports elsewhere. Ireland on the other hand is the most vulnerable with no deal causing Irish GDP to be 1.4% lower by end-2020 than a smooth transition. Ireland is the single most exposed country and it is also highly dependent on imports from abroad, so inflation would accelerate more quickly than other countries. Central & Eastern Europe and the Nordics also stand out with higher estimated GDP effects. This is because as non-eurozone economies, they are not expected to see similar depreciations to offset the negative trade impact – hence the relatively larger impact on trade-dependent Central & Eastern Europe and the Nordics. The impact on GDP in the rest of the EU27 is limited. Overall, it is clear that risks to the economic outlook of a no-deal Brexit scenario are to the downside. The UK is departing the EU at a time that the global economy is slowing down, offering limited opportunity to offset domestic weakness through the external sector. Our outlook is disruptive, with some major shocks but the situation is not disastrous. When translating this to insolvencies, a similar pattern emerges: a strong upward effect on insolvencies in the UK but only moderate impacts on those EU27 countries with close trade ties to the UK and limited effects elsewhere. However, the impact in insolvency growth compared to GDP growth is significantly larger. Atradius economic modelling has shown that on top of the strong link between GDP growth and insolvency growth, inflation, industrial production, and unemployment are also significant drivers of insolvency developments. For the UK, and most EU27 markets to varying degrees, lower GDP growth, weaker or declining industrial production and higher unemployment and inflation feed into more insolvencies. Besides multiplier effects, the magnitude of impact on business failures should also be larger than that on GDP discussed above. Since we are estimating the number of corporate bankruptcies, not the rate of bankruptcy, this indicator only captures the negative effects. It leaves out new businesses formed or corporate profits. Moreover, sectoral shifts are not fully captured by our model due to cross-country bankruptcy data limitations. As such, the sectoral analysis here is based on relative vulnerability. Overall, our estimates, therefore, are conservative; ten ultimate effect, especially in the UK, is most likely larger. We estimate insolvencies in the UK could be 14% higher in a no-deal Brexit scenario than they would be in a smooth transition – translating to about 2,300 more companies affected. Higher tariffs on exports of goods and services would weigh on companies’ profits while higher tariffs on imported goods would increase domestic inflation. The weaker GBP would feed further into inflation and not be sufficient to offset the higher trade costs. The higher inflation would also constrain consumer spending at a time that unemployment begins to increase slightly, likely feeding into higher insolvencies in the retail and hospitality sectors. Even if the Bank of England loosens monetary policy, heightened uncertainty could motivate banks to tighten financial conditions. Lower confidence and business investment are expected to cause industrial production to decline 2% in 2019 without a deal. The UK manufacturing sector, while a relatively small part of the economy (10% of GDP) accounts for about half of exports, leaving it particularly vulnerable to higher trade barriers. As a result insolvencies in the manufacturing sector would be particularly high. Other sectors with highly integrated supply chains with the rest of the EU27 could also see some concentration of higher insolvencies. This is particularly true for the automotive sector. Finally, UK corporates would also face higher non-tariff barriers with severe consequences for highly regulated sectors like food and beverage and chemicals. UK chemicals exports for instance would need their registrations transferred to an EEA-based organisation which would further undermine their competitiveness in the EU27. This would exacerbate the negative demand developments domestically by downstream sectors like automotive. For the EU27, the insolvency outlook is similar but much milder, similar to GDP developments. Unlike our GDP forecasts though, the insolvency outlook is more closely tied to trade exposure to the UK. As discussed in the preceding section, the small, export-intensive economies in the eurozone, such as Ireland, The Netherlands and Belgium, should see some support for exports to the rest of the world through euro depreciation. This plays a large role in mitigating the impact on GDP of a no-deal Brexit, whereas non-eurozone economies in Central and Eastern Europe and the Nordics are not expected to see such an exchange rate movement. Ireland again comes out as by far the most vulnerable with a no-deal Brexit driving insolvencies 4% higher than otherwise. 11% of Irish exports are destined for the UK and the disruptions at the Irish border could hurt corporates depending on their cross-border supply chains. Irish insolvencies would likely be concentrated in its manufacturing sector where 44% of its total value added is from exports to the UK. While the weaker euro could help manufacturing exports to for instance the United States, Ireland’s single largest export destination, the euro’s relative appreciation to sterling would further strain corporates in this sector. The food sector is the second most exposed – UK exports account for 40% of value added. On top of the loss of competitiveness and introduction of tariffs, non-tariff barriers surrounding food regulation would exacerbate the challenge for this sector. The Netherlands and Belgium have similar concentrations of exports to the UK as Ireland. The imposition of additional costs would strain trade and higher uncertainty would feed into lower GDP growth in these countries. The relative depreciation of the euro to the US dollar would feed into higher inflation in these economies, weighing on consumption and increasing costs for businesses. The impact on industrial production and unemployment is more limited though. While the aggregate estimated impact in insolvencies is only about 1.5% higher by end-2020 in both countries, this masks sectoral differences. Some sectors like construction and agriculture have very limited exposure to trade with the UK. For both countries, sectors like transport equipment, textiles, and chemicals all do have significant reliance on exports to the UK. With similar trade exposure, we forecast that corporate failures in Denmark could also be about 1.5% higher in the case of no-deal. Portugal could also see 1% higher insolvencies due to the failure to reach a deal than they would if there would be a transition deal to protect trade in 2019 and 2020. Portugal also sends 7% worth of its total goods exports to the UK, but more importantly, the UK is the largest destination of Portuguese service exports. The Portuguese tourism industry is particularly vulnerable to less British visitors. Spain also stands out in this respect. No-deal could also cause an additional 1% in business failures in Germany in 2019 and 2020 due to the high volume of trade directed to the UK. While the aggregate impact on the German economy would be limited, the manufacturing industry including automotive would see higher insolvencies due to trade frictions. This would especially spill over into higher insolvencies in Central & Eastern Europe. Due to data limitations, we do not quote specific impact forecasts for these markets, but they are also among the more exposed economies on the continent. Supply chain effects would be exacerbated by the depreciation of the euro and thus relative appreciation of these national currencies, further straining export growth. For the remainder of the EU27, the negative impact on insolvencies is expected to be contained below 0.5% relative to insolvency growth under a smooth transition period. As mentioned previously in this paper, we err on the side of caution in our impact estimations, especially for the EU27. The risk that insolvencies could rise more than expected is greater than the risk of a more mild impact. Moreover, the impact on insolvencies across Europe is expected to be more localised and sector-specific. Overall, the transport equipment and textiles sectors are most vulnerable to trade frictions due to exposure to the UK.